Ukuran pratayang ini: 800 × 427 piksel. Resolusi lain: 320 × 171 piksel | 640 × 341 piksel | 1.024 × 546 piksel | 1.280 × 683 piksel | 3.000 × 1.600 piksel. 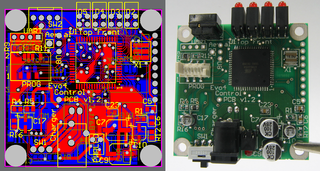 English: This picture shows (left) a printed circuit board (PCB) layout, created on a computer and (right) the manufactured board, populated with parts. Both through-hole and surface mounts components have been used; the board is double-sided, with through-hole plating, green solder resist, white solder paste (visible on unsoldered holes, such as the four corner mounting holes and the nine holes down the right hand side of the board) and white silkscreen printing. Italiano: Progetto di un circuito stampato a sinistra e realizzazione a destra. Deutsch: Links das im CAD erstellte Layout einer Leiterplatte, in dem die verschiedenen Lagen mit unterschiedlichen Farben dargestellt sind. Rechts die daraus hergestellte und mit Bauelementen bestückte Leiterplatte. Español: A la izquierda la imagen de la PCB diseñada por ordenador y a la derecha la PCB manufacturada y montada. Magyar: A baloldalon egy NYÁK CAD program segítségével tervezett rajza, a jobboldalon pedig a rajznak megelelően elkészített panel látható. 한국어: 컴퓨터로 설계된 인쇄회로기판 (왼쪽) 및 기판과 부품이식된 실장 (오른쪽). 기판은 홀로 통하는 도금, 녹색 땝납 저항, 흰 땝납 페이스트, 흰 실크스크린 프린트가 있는, 양면이다. 양쪽 표면 실장과 홀로 통하는 부품은 사용되었다.